Those little pennies can add up. It has always made me wonder about the way people treat a common penny. I always seem to spot those pennies on the ground. People will drop them and won't take the time to bend down and pick it up. I bet in the last two or three years, I have picked up a couple hundred pennies. That's right, maybe $2 or $3 worth. All the pennies that I have bent over to pick up, there is one that I will always remember. It was late December of 2013. I was walking through the center of town in Marple, England. I looked down and saw this shiny copper object. I bent down thinking it was an English penny, then to my surprise I realized it was an American penny. Here I was, well over 1,000 miles from the East Coast of America and I was holding an American penny. Some other American, traveled to this town and I'm sure they enjoyed their visit as much as I have enjoyed mine. I brought that penny back home and put it in a big water jug, which has over 10,000 pennies in it. What is that old saying? A penny saved is a penny earned. Like I mentioned it does make me wonder why people treat pennies the way they do. A person will drive all over town to save a penny or two to fill their car with gasoline. They will moan and groan when a loaf of bread increases in price. Don't get me wrong, I also get upset with the increase of prices with our groceries. That is why, to me, watching those pennies do add up. I can't understand the need to save a penny on gas, yet no one seems to worry about getting the best interest rate for our savings. And what is even more insane to me are the folks who don't save anything. I know a person who is in debt up to his ears and sees no need for an emergency fund. His belief is that he could die tomorrow so why not live for today? The reality is he isn't living at all. Every time he gets some money it goes right away to paying for the past. Credit Card debt has destroyed his future. He has a hard time understanding that by using the credit card he is living in the past. Every paycheck he gets shows that. Whenever an emergency pops up, he applies for a new credit card. This person has every store credit card a person could want and then some. Need clothes? Well we have Macy's and Walmart and JC Penny. You need car work done? We've got Goodyear and TO Haas for your tire needs. Electrical needs? Best Buy and Radio Shack has you covered. And of course, there is also E-Bay and Amazon to fill in the cracks that these stores can't quite cover. I know there are a few major credit cards in there as well. Those are rarely used. I believe because there is little or no money with them. I believe he pays the minimum on them and just continues to fall behind with them. I have three major credit cards. I have no store cards. Since getting out of my own financial nightmare, I have never paid a dime of interest on these cards. I try to use one at least once a month, then the next month, use the next card. One card has a specific purpose – traveling. It has a great cash rewards program which helps me save some money going to England. 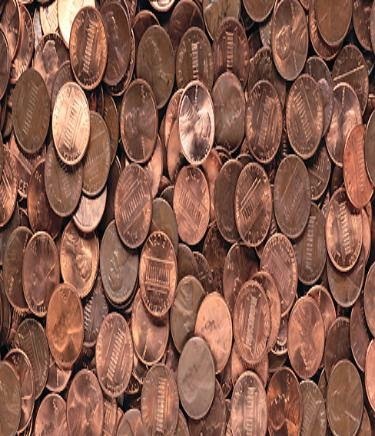 The point is – pennies add up. Whether you are using cash or credit, they can make or break your life. I used to think that “only $10 a month” was a great deal to buy a TV or a stereo on credit. Yet, I would never save money for $10 a month. Try getting rid of your debt and live a cash only lifestyle. Like I said, I use a credit card but I never carry a balance on it. If you use a credit card, commit yourself to paying it in full every month. Don't let the interest charges control you. A general rule of thumb is to never use more then 10% of your available credit. So if you have a credit card with a $5,000 limit and one with a $2,000 then you have $7,000 available credit, of which $700 can be used. That doesn't give you a free ticket to spend $700. If you know you can't pay that amount back in one month, then lower that amount to 5%. I have spent a lifetime working for money. Money to pay the bills and just to survive. Now my life is having money work for me. July 4th, I purchased my round trip ticket for a winter holiday in England. This is the fifth year that I have made this journey. It's a lovely way to end a hard year of work. Every one of these journeys has been paid for with cash.